The long-awaited flavors of fall are captured in special release beers presented in the Farm-to-Cask Brewers Challenge. 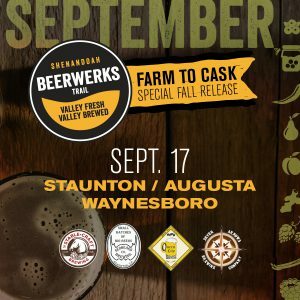 The first fall collaboration among the breweries of the Shenandoah Beerwerks Trail, Farm-to-Cask showcases a one-weekend-only beer by each craft brewery. It’s a great day to sample and celebrate the harvest of the Shenandoah Valley. The charge to incorporate local ingredients with seasonal brews kicked off last weekend in Harrisonburg. Robust flavors were on tap at Brothers Craft Brewing, Three Notch’d Tap Room, and Pale Fire Brewing. Now see what the brewers of Staunton, Waynesboro, and Augusta County have whipped up for this Saturday’s cask tap. At Queen City Brewing Co. the Blackberry IPA includes local blackberries, of course. The abundant fruit is so readily available that neighboring Shenandoah National Park hosts an annual “all things blackberry” celebration in July. Redbeard Brewing Co. has infused their Mosaic IPA with locally-grown Carolina Reaper Peppers, proclaimed the “world’s hottest chili” by the Guinness Book of World Records in 2013. The Carolina Reaper’s average SHU (Scoville Heat Units) is 1,569,300. For comparison, a Jalapeňo averages 2,500-5,000 SHU. The working farm brewery in Waynesboro, Stable Craft Brewing, is using home-grown ingredients to add über local flavors to their Harvest Ale. Cascade hops are a foundation of the Stable Craft line-up, but fresh-from-the-farm peaches and blackberries will add a sweet punch for your palate. It’s apple season in Virginia, and Seven Arrows Brewing Co. is tapping a very Virginia apple lager this weekend. After brewing, the beverage is infused with locally-grown Cascade hops. Venture over and take a sip. Wrap up your Farm-to-Cask day with more tastes of the Valley. Restaurants like The Shack and Zynodoa offer savory farm-fresh entrees to complete your adventure.